What to DO to Stop Putting Things Off! YES: How to Get What You Want! Do you sometimes get dizzy, headachey or nauseous, or too tired too easily? Your body's electrical system may be out of whack! 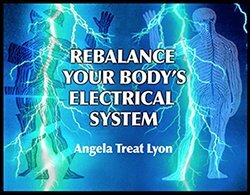 CLICK HERE to get this FREE eBook that shows you how to rebalance your body's electrical system - see how I did it for myself for poisoning from paint fumes!